Nuclear weapon testing has left a legacy of residual contamination from radioactive materials which have a variable degree of significance for human health and the environment. This week, France agreed to compensate five French Polynesians for the damage caused to their health by its nuclear weapons tests in the South Pacific. Since the first nuclear weapons were used on Japan at the conclusion of World War II, more than 2,000 nuclear tests have been carried out predominantly by the five “declared” Nuclear Weapons States, China, France, the United Kingdom, the United States and the former USSR. More than 500 of these were ‘atmospheric tests’ conducted above ground mostly in the ‘50s and ‘60s, after which more than 1,500 were carried out underground. In 1960, France became the fourth country to test and independently developed nuclear bomb, and currently has the third-largest nuclear weapons stockpile in the world. France is understood to have tested neutron or enhanced radiation bombs in the past, apparently leading the field with an early test of the technology in 1967, including a neutron bomb in 1980. By 1968 only France and China were detonating nuclear weapons in the open air and the contamination caused from Hydrogen Bomb testing led to a global protest movement against further French atmospheric tests. The Mururoa and Fangataufa atolls located in French Polynesia, are just north of the Tropic of Capricorn, in the middle of the South Pacific Ocean about halfway between Australia and South America. On August 24th, 1968 France detonated its first thermonuclear weapon — codenamed Canopus, which yielded a 2.6 megaton blast (roughly 170 times more powerful than the nuclear device dropped on Hiroshima) over Fangataufa. From 1960 to 1996, France is known to have conducted at least 210 nuclear tests, nearly 200 of them were carried out in French Polynesia, 46 of them were atmospheric. With the exception of four tests (three at Mururoa and one at Fangataufa), which carried out on barges floating in the lagoons, most atmospheric tests were carried out with the nuclear device suspended from balloons, hundreds of meters above the lagoons. Most of the radioactive material was transported into the upper atmosphere where it was carried around the world. To this day, several kilograms of plutonium resulting from four early atmospheric tests remain in the lagoon sediments of each atoll, and contamination containing plutonium remains in a small, low-lying area in the islets of Colette, Ariel and Vesta at Mururoa Atoll where the five atmospheric “safety trials” were conducted. After two tests within 17 days in 1966, radiation at five times the permitted annual dose was measured on the Gambier islands. After three tests in 1974, radiation equivalent to the entire permitted annual dose was measured in Tahiti. There have been long-standing demands from both Algeria and French Polynesia which claim injury from France’s nuclear testing program. 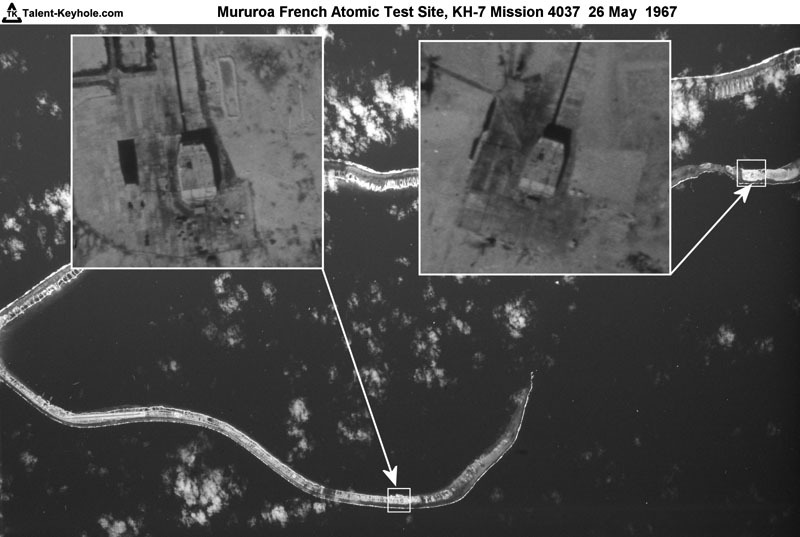 Until 2008, France claimed that its nuclear weapons tests in the Pacific were clean and had caused no harm. An official French government report by INSERM confirmed the link between an increase in the cases of thyroid cancer and France’s atmospheric nuclear tests in the territory since 1966. One Algerian group estimated there were 27,000 still living victims of ill effects from the 1960-66 testing there, while the French government had given an estimate of just 500. The United States is known to have helped the French by essentially playing “20 Questions” with French scientists working on the nuclear weapons program, guiding them to the right answers by acknowledging when they had made a correct statement or observation. This was highly criticized of course, and many the leaders privately felt that if the US connection with French nuclear tests were discovered that they would face accusations of having encouraged the French tests in order to gather data which the US would’ve been otherwise unable to acquire due to their self-imposed nuclear test ban.